The new updated V4 Stokke Xplory fits around your baby, from top to bottom with every inch designed to enhance the experience of moving through the world together. The new updated V4 Stokke Xplory fits around your baby, from top to bottom with every inch designed to enhance the experience of moving through the world together. The new Stokke Xplory chassis provides improved features over its predecessor; it features an even easier folding mechanism and the front wheels are now lockable by a conveniently positioned , foot-operated trigger. The shopping bag now fastens directly to the foot board with clips, avoiding the strap obstructing the folding process. In addition the cup holder attachment is now integrated into the stroller handle. From the obvious height advantage and the elevated seat, down to the adjustable footrest. Ensuring safety and ease of movement no matter how tall or small your child is, Stokke Xplory V4 enables comfortable and secure movement wherever you go. The adjustable seat means your baby can face you rather than away from you. This encourages eye contact and feelings of safety, security and unity: it’s the most comfortable position for a baby. Later the seat can be switched to face forwards so your growing child can begin to explore the world. Stokke Xplory V4 offers an almost infinite choice of seating positions to suit children’s ever-changing needs, meaning your child’s size and position can be comfortably and safely accommodated at every age, and in any situation. Whether your baby is feeling sleepy and relaxed, or active, engaged and ready to explore the world, Stokke Xplory V4 stroller’s seat position can be altered with a few simple clicks. And of course Stokke Xplory V4 meets all relevant international safety standards. Now just push, and go! Soft padded seat: Gives a comfortable ride for the child. Shopping bag: Brings the weight of your shopping down to ground level which makes the stroller even more stable. 5 seating positions: 3 positions facing parents: Sleep, rest and active & 2 facing forward: Rest and active. Two-way sitting: Facing parents for bonding, interaction and security // Facing the world to explore when the child is ready. 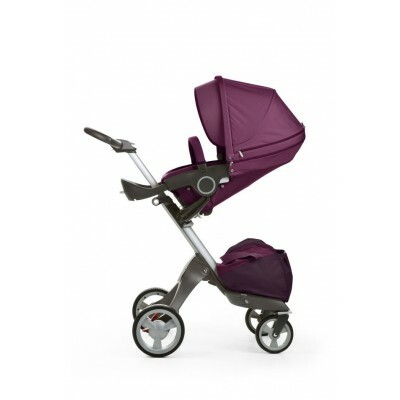 Height and angle adjustable handle with ergonomic design: Easily adjusts to fit the person pushing the stroller. Water repellant hood with netted fabric: Ventilation improves the air quality and reduces the risk of moisture inside the Carry Cot/Seat. Official testing methods may vary in different countries or regions. Standards valid in the US/Canada recommended a maximum weight for normal use of 45 lbs for the Stokke Xplory V4 Seat and 20 lbs for the Stokke Xplory V4 Carry Cot. For area except US/ Canada maximum weight for Stokke Xplory V4 Seat is 15 kg/ 33 lbs and 9kg/20 lbs for Stokke Xplory V4 Carry Cot. Two-wheel function: Easy to stroll on rough and uneven surfaces (on the beach, on pebbles etc.). Swivel wheels: Easy swivel front wheels make it easy to manoeuvre in tight spaces. Soft material: No risk of puncturing. Quick release back wheels for more compact folding. Single brake solution for both wheels: Unique single action brake without stride restricting crossbar between the wheels. Space between the wheels. No crossbar between back wheels to restrict the way you walk. How would you like to spend your days at ground level, staring at other people’s feet? Adults often forget that children don’t always get to see the world from our lofty perspectives. Too often, they are pushed around town at the same height as our knees, out of touch with us and with the world around them. The unique height-adjustability of the Stokke Xplory V4 ; allows kids to be raised to your level in safety and security, strengthening your bonds, promoting interactivity and encouraging all-important eye contact - while exploring the world together. Optional opening for ventilation through 30% of the hood to prevent your child overheating. Opening protected by mosquito net. Carry handles fastened to the sturdy plastic gives a very safe solution when carrying the Cot. Soft interior lining: Comfortable environment for the baby. Cover lined for extra protection. Removable for temperature regulation of the baby’s environment and allows easy access to the baby. Brings the child up close to the parent to stimulate bonding and development. Fits table heights in cafés/restaurants. Makes the child comfortable through stimulating movement and variation whilst sitting. You can adapt the foot rest position as the child grows. The Stokke Xplory V4 stroller’s ingenious adjustable footrest ensures no dangling feet, whatever the height of your child. This is not just a question of comfort, though. A footrest fastened at the correct height can help to aid the healthy development of bones, joints and muscles. And feet planted firmly on the footrest enable ease of movement of the upper body too, meaning your child can readily shift his or her seating position at will. 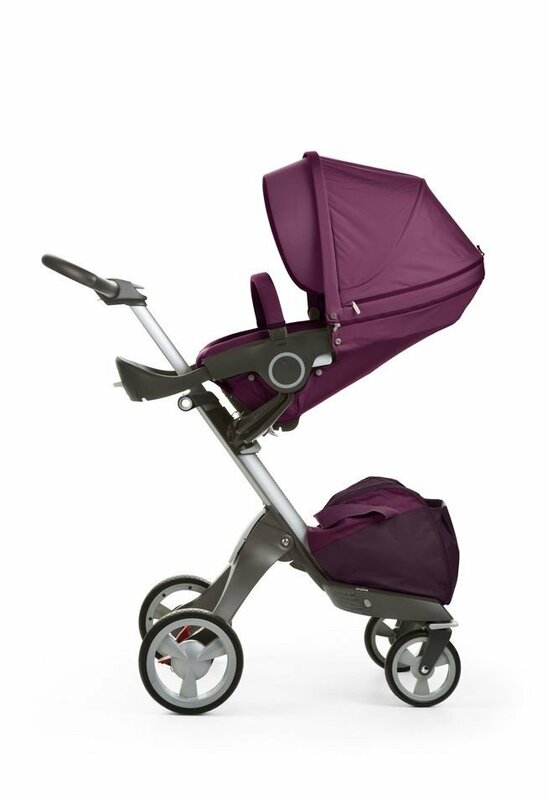 The Stokke Xplory V4 is fitted with a removable seat insert to accommodate the smallest babies. The reduced depth that the insert creates makes for a seating position designed for the shortest of legs, and offers a flatter back position for when your baby is resting or sleeping. This helps to reduce stress and ensures healthy growth. Then, as your child gains in height and weight, you can remove the insert so that the depth of the seat corresponds to the length of your child’s legs. This way, one size really does fit all – and children can be kept safe and secure right up to the time they’re ready to take on the world on their own two feet. An extra cushion that reduces the seat depth to fit the smallest babies. Offers soft, but firm support for tiny backs. With the baby insert the most relaxed position gives an optimal lay-back angle of 10 degrees up from a horizontal level. Can be removed when baby needs more space to sit. I would not recommend this item to a friend. quality very good, great to have the baby so close. This is a gift for a friend and I hope they will enjoy this beautiful stylish stroller. the stroller is just amazing, so versatile and super stylish, i though it was going to be super heavy and bulky, and its no different than other strollers ive seen around. worth every penny! !